idealiskt beläget, mycket tyst, mycket bekväma. Nybyggda, stor terrass som erbjuder en magnifik utsikt över Turkiet och de grekiska öarna. Busshållplats bredvid huset som tjänar centrum och mataffärer i närheten. För de som söker lugnet, strand, bad och vila medan 1. 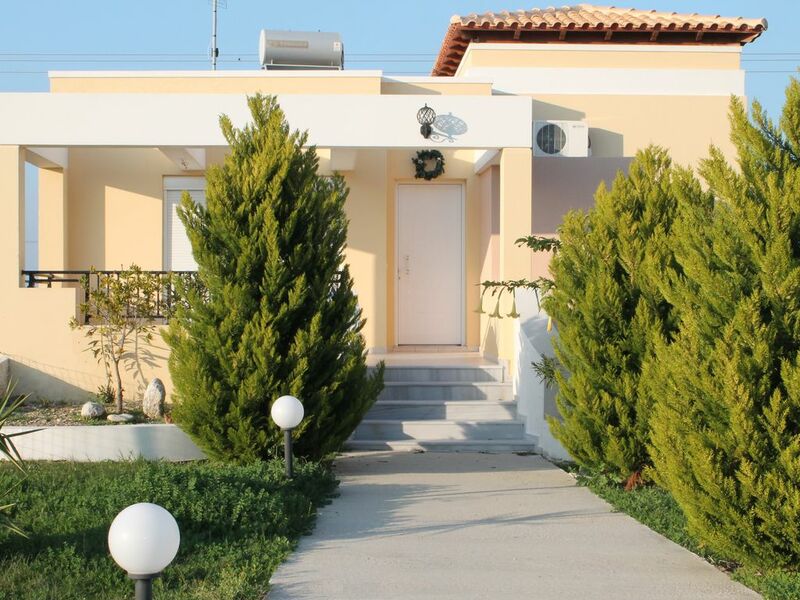 The villa is modern, spacious, and very clean. The house has wonderful views of mountains from the front, and the sea, Greek islands and Turkey from the rear. The house is very well equipped with kitchen items, towels, bedding and outside furniture. There is a single air conditioning unit, but this does a good job of cooling the whole house if internal doors are left open. The house has one room with a toilet and a sink, another room with just a toilet, and a third room with a sink, a shower, and a bath with shower. There is one double bedroom and two twin rooms. There is a large rear terrace, a small front terrace and generous gardens to the front and rear. The location worked very well for us being 30 minutes drive west of the airport and 15 minutes east of Kos town, meaning that many of the attractions are only a short drive away. The house is a 15 - 20 minute walk to the nearest beach, and there is bus stop right outside the house, so it would be possible to stay here without renting a car. The house felt private, but not isolated. The owners, Agnes and Vince, were very hospitable. They provided a cot and high chair for our daughter. Offered to help organize a rental car, and very helpful with any questions that we had. They were also very flexible about the check-in and check-out times due to our late flights. We enjoyed Kos much more than we were expecting. The people were friendly, the food was good, the weather was great, and there were a surprising number of places to visit. This house made a great base for exploring the island, and I would happily stay here again were I to re-visit Kos. Une maison très agréable et facile à vivre, il n'y manque rien, à 10 minutes à pied de plages belles et calmes même en août. Les propriétaires sont venus nous chercher et nous ramener à l'aéroport, ils nous ont offert des légumes de leur jardin ainsi qu'un dîner le premier soir. Vraiment à l'écoute et attentifs : ils nous ont présenté des commerçants, tout est à proximité, bar, restaurant, commerces. Nous avons loué des vélos, c'est formidable en famille, sinon le bus passe dans la rue. A recommander pour des vacances dans un cadre très naturel.